Here’s another recipe using wild garlic, in abundance at this time of year in woodlands and by rivers. You can even dig some up and plant it in a window box for a future supply. It may wilt at first but will spring back with a vengeance. If you can’t get hold of any wild garlic, just use rocket or another green. This recipe also makes use of seasonal veg – feel free to substitute whatever else you might have – beetroot, celeriac, squash and so on. Serve the veg with brown rice or quinoa and spoon over some of the pesto for a delicious hearty dinner! Serves 3 to 4 people. 2. 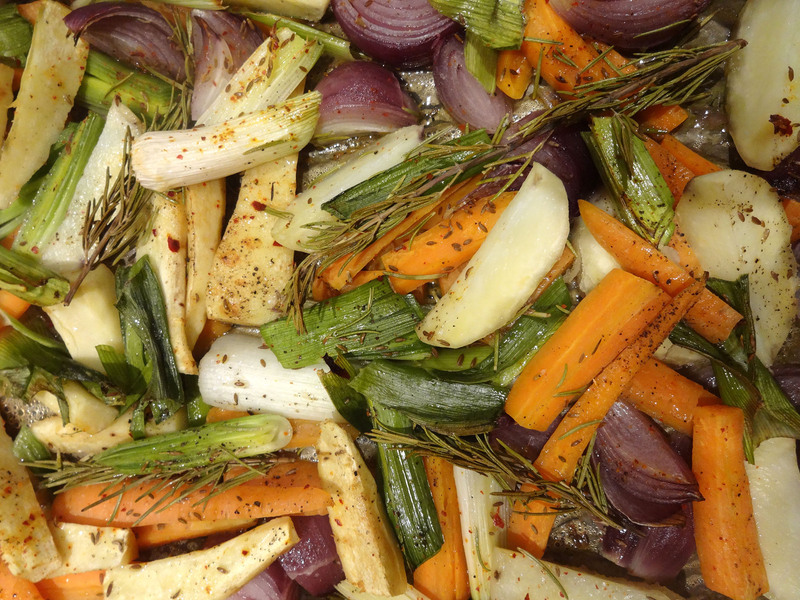 Tip the veg into a roasting tin lined with greaseproof paper and season with salt and pepper, pour over water to cover the base of the tin (about 5mm deep), drizzle over some oil, add some sprigs of rosemary and a pinch or two of chilli flakes, then put into the oven for 35 minutes. 3. To make the pesto, put a generous handful each of wild garlic and rocket into a blender, followed by the cashews, the oil, a splash of balsamic vinegar, the lemon juice and some salt and pepper, and blend until smooth. 4. 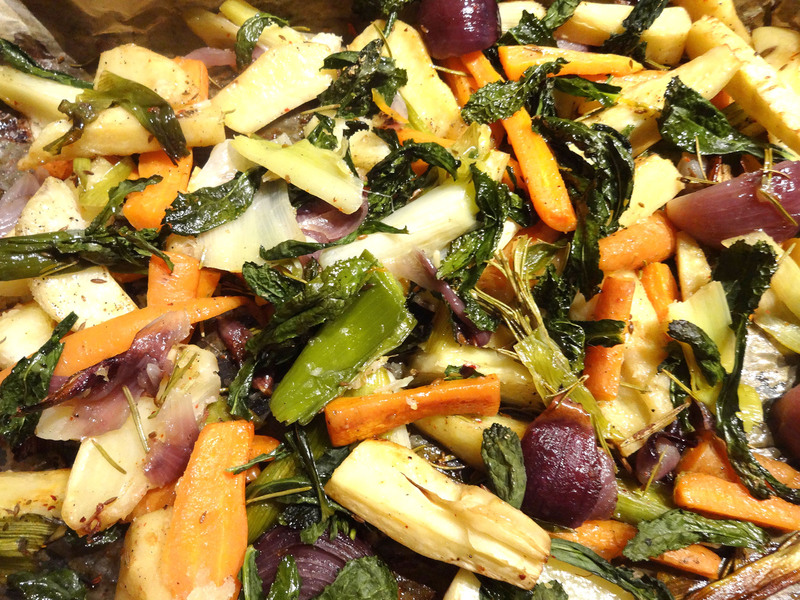 After 25 mins add the kale to the roasting tray for the final 10 minutes of cooking. 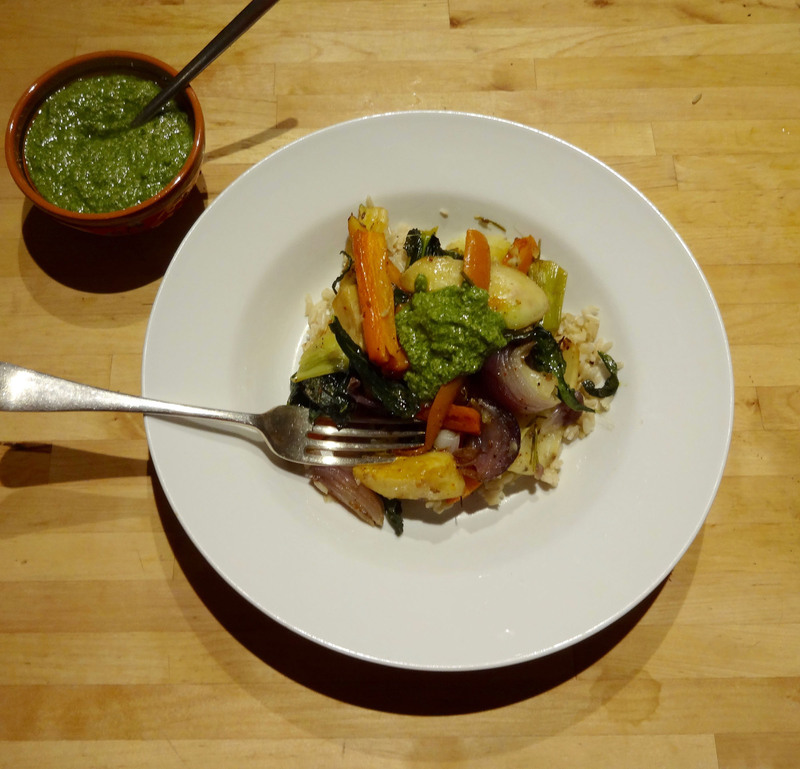 Serve the veg with brown rice or quinoa and spoon over some of the pesto!